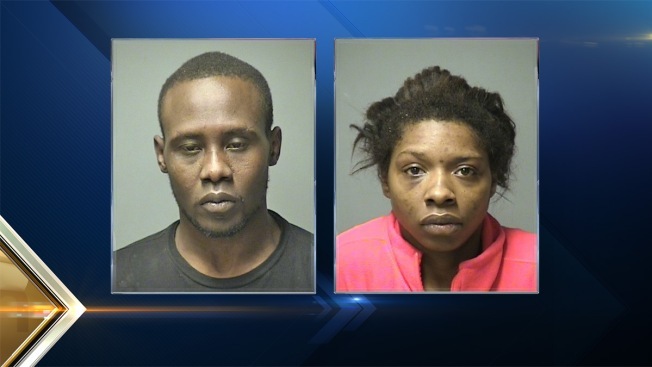 Charles Ali and Ebony Perryman-Jones were arrested by police in Manchester, New Hampshire following an early morning SWAT raid on Tuesday. Two people were arrested following an early morning SWAT raid in Manchester, New Hampshire, on Tuesday. Manchester Police detectives prepared an arrest warrant for Charles Ali, 29, of 63 Goffe St., after he allegedly sold crack cocaine to undercover officers. They executed the warrant at 6 a.m. Tuesday along with members of the Manchester Police SWAT team. Police located multiple individuals inside the property, including Ali and 22-year-old Ebony Perryman-Jones. Ali was arrested and charged with sale of crack cocaine and violation of bail conditions. Perryman-Jones was also arrested on an outstanding forgery warrant. Detectives seized a 12-gauge shotgun from the residence, but did not locate any additional drugs. Perryman-Jones was released on $2,000 personal recognizance bail and is scheduled to appear in Manchester District Court on Dec. 30. Ali's court date has not been issued.